Paan is the delicacy among all communities in India. Its cultivation and propagation will serve to strengthen not just the various rituals associated with this leaf but also the families involved in its farming. WAJAD ALI SHAH, the last nawab of Avadh (Oudh), reaches out for an intricately carved silver khaas daan (a container for betel leaf) and gingerly takes out a green triangle dangling from one of the fine silver chains. Putting it in his mouth, he ruminates, savouring its flavour as he ponders on the next lines of his limerick. This scene out of a classic cinema gives paan (Piper betel) its place in history for this leaf has not just served merely as a mouth-freshener but has been a symbol of royalty, status, pleasure and addiction. Eating of paan has been elevated to the level of fine art. The heart-shaped green leaf with khair (Acacia catechu), chuna (lime), supari (betel nut, Areca catechu), elaichi (cardamom, Elettaria cardamomum), zarda (scented tobacco) and a host of other condiments are neatly folded into a triangle in nifty fingers and put into the mouth to be savoured over hours. Its flavour and aroma trigger off senses that are, supposedly, divine. Today, the paan has lost its place of pride to such cheap substitutes as paan parag and paan masala that are more suited for the fast-paced life of today. 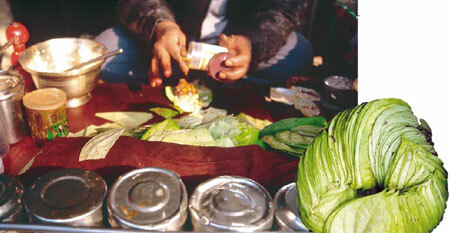 Paan is also associated with various traditions. It is offered to Gods and used in social and religious rituals. In south India, people send out paan and supari along with invitation cards for marriages. The symbolic importance of paan rose with the rise of Rajputs and it became a symbol of dignity. During the Mughal period, paan was given as land revenue by the Mahoba estate of Allahabad in Uttar Pradesh. The practice of eating paan with chuna, khair, supari, long (clove, Syzyium aromaticum) and elaichi was started during the Mughal period by Noor Jahan, the queen of Shah Jahan. This has undergone various changes over the years and today paan is eaten with various condiments like peppermint, tobacco, sweet and are smeared with gold and silver foils. Not merely a mouth freshener, paan, a creeper, has various medicinal properties too. It is an appetiser, digestive stimulant, rejuvenator, laxative, and blood purifier. It has 0.1 per cent volatile aromatic oil. Essential oil from its leaves is an antiseptic and is used for curing respiratory troubles and catarrh. It contains some amines, hydrocarbons, carbohydrate, chlorophyll and some enzymes. A leaf has about 100 calorie. In India, paan is mainly cultivated by the tamboli, barai and chaurasia communities. They are generally small landholders and marginal farmers who grow it with care and expertise. It is grown in almost every part of the country except the dry northern parts. It thrives best under tropical forest conditions with shade, considerable humidity and plenty of soil moisture. The Council of Scientific and Industrial Research (CSIR), New Delhi, has documented 35 varieties of betel grown in India. In Hazipur, two varieties of paan, the Kalkattia (one from Calcutta) and Desi paan (local variety) are grown. Surprisingly, Desi paan is cultivated in small quantities. When inquired, Naresh Chaurasia said: “We are only keeping our tradition alive for there is very little money in this. Hardly anyone buys paan. Now people are more price conscious and do not go for expensive, good quality. The desi paan is sweeter, softer and tastier than Kalkattia and is also non-fibrous. Yet it has little demand because its size is small. Four leaves of it are required to make a khilli (one dose) whereas only one leaf of Kalkattia can make a khilli because of its large size,” explains Naresh. Generally the desi variety was often substituted for Magahi (a good and expensive variety grown in other areas) because the size of both were the same and only experts could discern the difference. Paan is cultivated in specially prepared thatched bamboo houses, that permit little light and heat and retains maximum moisture. It is propagated only vegetatively by stem cuttings, taken from two-year-old healthy plants. A plant provides about 40 to 60 leaves a year in four to five harvestings. In the first year, the cost of cultivation is about Rs 6,000 but the earning is only Rs 3,000 because only two harvesting is possible. But, in subsequent years, the cost of cultivation comes down to nearly Rs 2,000-2,500 and earnings increase to about Rs 6,000-9,000 from one kattha (163 square metre). The plant provides leaves for about five to six years. Leaves are sold in local markets for Rs 5-15 per dholi (a local unit of paan trade equal to 200 leaves) depending on the season and availability in the market. Traders sell it to shopkeepers for Rs 20-25 a dholi. Pests and diseases are the main enemies of this plant. Deo Narayan Chaurasia, a cultivator, says: “We do not know much about the pests but they destroy the leaves very fast. We spray pesticides used for vegetables. The plant needs moisture but again is very cold sensitive. During peak winter season, the plants stop growing and sometimes turn yellow and ultimately dies of laffa rog (leaf blight).” After harvesting, the leaves are consumed or marketed as early as possible because they rot very fast. It can be stored only for about four to five days with proper moisture. Paan is sold through local mandis (market) of Hazipur from where they are transported to different towns of Bihar and Uttar Pradesh. There are two small markets where local cultivators sell their crop to traders. “The average daily business from these two markets is about Rs one lakh,” says Shiv Jee Chaurasia, the head of paan mandi. “We are not satisfied with the returns because middlemen take the major share as there are no regulated markets,” he says. Cultivators say they need government support to market, store, and protect paan. They also need insurance of their plantations as the plant is very delicate. Shankar Kishore Choudhary of Subidha Medicinal and Aromatic Plants, Hazipur, says: “Five years ago, the then agriculture minister of Bihar, assured us that there would be a research institute for paan in the region but it has not come up yet. We do not get any financial support from banks. We have no access to any storage facility and hence we have to sell the leaves at any cost when they are plucked.” He also expressed concern over lack of research on growing pakka pan (yellow bleached leaves) which is sold at a premium. The cultivators have tried it on their own but have not been successful.